If you are looking for a fast and powerful machine to remove a variety of tattoo colors, as well as treat pigmented lesions, the Cynosure Affinity QS laser machine needs to be included on your list. This cosmetic laser system offers two wavelengths – 532 nm and 1064 nm – to give it the ability to remove a wide range of tattoo colors. The Cynosure Affinity QS is easy to operate and can smoothly switch spot sizes and wavelengths for efficient treatments. With its dual wavelengths, the Cynosure Affinity QS is like getting two systems in one. But that doesn’t mean you need to pay more, and in fact SunrayLaser.com has pre-owned Cynosure Affinity QS laser machines for sale at up to 60% off the new retail cost. 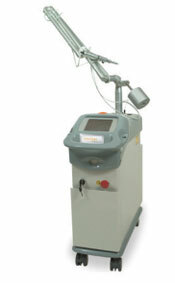 We also back up our used cosmetic laser equipment with a full satisfaction guarantee. We want you to be completely comfortable with your pre-owned cosmetic laser system purchase, so we won’t try to rush you into a decision. Even if you are just comparing cosmetic laser machine prices, we are happy to help. Simply fill out the form below if you are interested in a low price quote on a pre-owned Cynosure Affinity QS laser system. Cynosure is one of the most respected names in the cosmetic laser industry, and their systems are well known for their reliability and performance. That makes Cynosure lasers an excellent option if you are looking to buy a pre-owned system, and you can find the lowest Cynosure cosmetic laser prices at SunrayLaser.com.